Live from Atlanta… another crazy busy week. 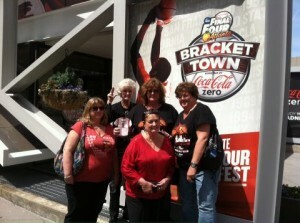 I traveled south for the NCAA Final Four with “the girls” so I’m posting from here tonight. Congratulations to the Louisville Cardinals on their win! Kenny is at home working, he planted broccoli, cauliflower and cabbage last week and is planting our “candy onions” this week for the market. He just keeps working and I keep traveling, what a guy! I’ll be home just in time to get the greens washed and the eggs packed for market on Saturday. This week we will be taking orders for the greens we have available… baby lettuce, spinach, and kale. Don’t forget to pick up your farm-fresh, free-range eggs at the market. We have quite the variety… brown, green and quail eggs too. Just a reminder that we have been selling out early each week… so come early or pre-order to make sure you get the items you need. My friend Valerie Shealy’s local honey will also be available this weekend.